I do not remember what I was thinking when I purchased this book… it wasn’t my usual mystery/ murder/ or fantasy type. But it certainly was interesting and got me to thinking alot. How would you deal with the fact you no longer remembered the last 10 years of your life? You don’t remember having 3 children, or what they even look like. You don’t remember that you are in the process of a divorce from the man you married and loved and was the father of your children… Difficult to think that could happen or how you would feel. 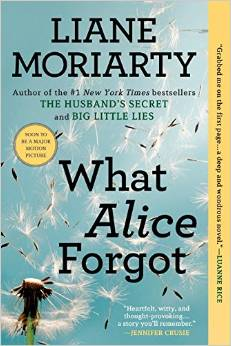 So, as different a book that this is to what I am use to reading…it was a book that I kept picking up, wanting to know how Alice was dealing with it and how it would all end. In between there was her sister Elisabeth who had her own tragedies so you have a secondary story to follow. A very enjoyable story and well told by the author. It certainly makes you look back on your life and wonder, what if it happened to you? Would your life be different today from it? 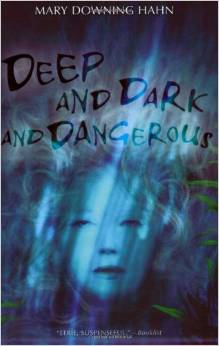 Deep and Dark and Dangerous by Mary Downing Hahn. wow! A quick and excellent ghost story! Not sure what I expected but this was quite a good, short read! The mystery behind the whole story doesn’t totally come out until close to the end, but all along you know secrets are being kept by the adults in the story. I really enjoyed this little book… couldn’t put it down! Great little book to have with you when on the move. Guessing this book would be for anyone but believe it was written for ages 9 and above.. ’cause it is a bit scary! 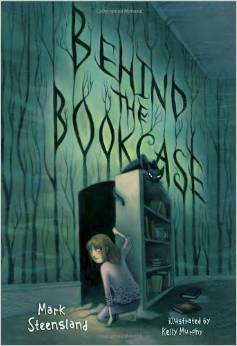 Behind the Bookcase by Mark Steensland. I must have found this for 50 cents .. and even if it’s written for the very young.. it’s still a fantasy fiction. A great book to have your child read or to read to them! Nicely illustrated too! But, I will let the Amazon review let you know what you need to know. 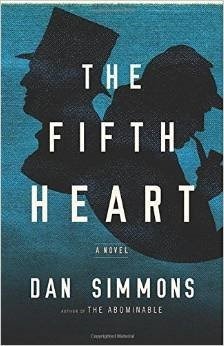 The Fifth Heart by Dan Simmons. Hooray! Dan Simmons has done it again! I know Dan Simmons has many books out, many of which are not to my topic liking, but when he does one that suits me.. he’s fantastic! I’ve read his book Drood (over 600 pgs ) twice because I like it so much.. now I can add The Fifth Heart! He is a master at taking real characters, mixing them with fictional character adding great descriptions of time and places and come up with a really good book to read. This time his main character is "fictional, Sherlock Holmes".. or is he fictional? It takes place in the United States (I prefer stories in the British Isles) and uses many historical real characters. On the day that James decides he will commit suicide he meets Sherlock and Sherlock basically turns him, for all intent and purposes, into "Watson" (side kick), and in turn saves his life. I was running through this books when I was due to have company and then go away for a week and so the last 140 pages I just finished today. If you like books that use fictional and real characters along with a good story… this book fits the bill! I’ll keep this book along side of Drood, for a future reread!